Tucked in Pearl Drive Mall along Fairview is a Filipino restaurant serving great Filipino food at affordable prices. Since I went to SM Fairview to visit my Souvenirlab store (www.thesouvenirlab.com) today, we had our lunch at Toni’s Grill on our way back. 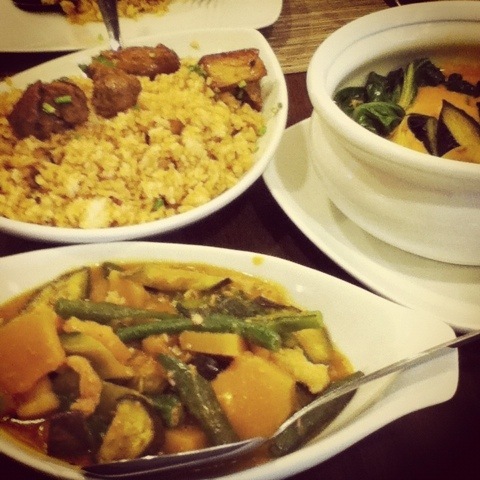 This was what we had for lunch – Adobo Rice, Kare Kare and Pinakbet. Again, apologies for the photos. I only had my iPod with me the whole day. I wanted to order the Boneless Crispy Pata (which is a house specialty) but had to restrain myself as there was only 3 of us having lunch. Instead, we ordered the Kare-Kare. The Kare-Kare was made from peanut boiled, mashed and cooked fresh on a daily basis by the restaurant. It is packed with Twalya and vegetables and perfectly combined with their Bagoong (shrimp paste). I also love the Pinakbet (around PHP98.00) and the adobo rice (PHP98.00, I think!). Best of all, our total bill was only around PHP450.00! My favorite resto along fairview. A formidable share, I slimpy given this onto a colleague who was doing slightly evaluation on this. And he in actual fact bought me breakfast because I discovered it for him.. smile. So let me reword that: Thnx for the deal with! However yeah Thnkx for spending the time to discuss this, I feel strongly about it and love studying extra on this topic. If attainable, as you turn out to be experience, would you thoughts updating your weblog with extra details? It is highly useful for me. Large thumb up for this blog post!